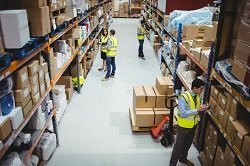 Reducing or allocating labor is an important driver for exploring warehouse management solutions and recognizing a return on investment (ROI). A properly implemented WMS system can reduce your labor needs, help you reallocate staff and or keep you from needing to bring on more staff to meet growing sales or seasonal fluctuations. Additional workers add to an already complex and hectic warehouse. There is a long list of labor areas that are strongly impacted by the implementation and use of best practices while deploying a WMS. From the moment product hits your receiving dock until the invoice is sent for the shipped out items people are involved. By using a WMS, you increase the efficiency and accuracy of the work they do while eliminating the mistakes they will make. A best of breed WMS should provide useful labor reports that can help you determine who your best people are and who needs help. When the WMS is integrated tightly to ERP/Accounting/Business Management System you can eliminate the costly clerical work. This allows the people doing this manual data entry to be re-positioned into areas that will help the company make money not just spend it. Another plus here is the accuracy factor a WMS provides. You can also speed up the invoices process which gets you paid in a more timely manner. Lines picked per shift are improved. Inventory accuracy is dramatically improved. Reduced staff and increased work volume. Shift elimination and or hour reductions.